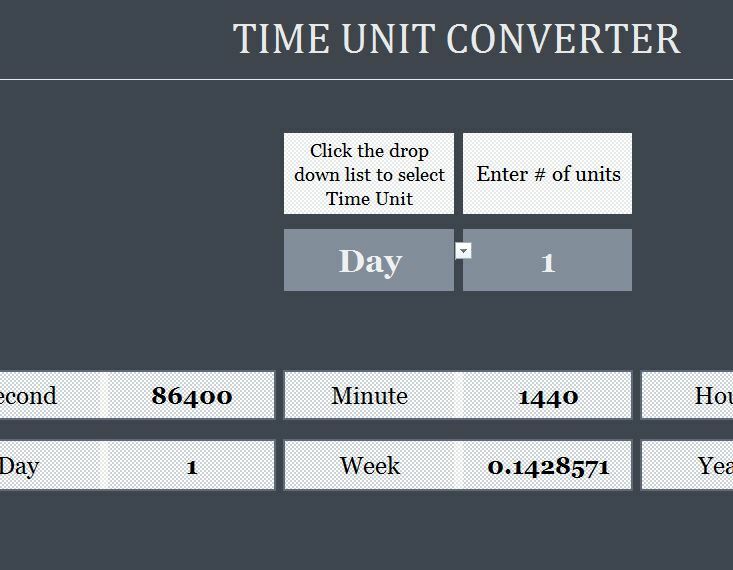 The free Time Converter Spreadsheet is here to help you convert minutes into hours and weeks into seconds! This free document is as simple and straightforward as can be. All you need to do is input two different items into the required field of the document, and you’ll instantly have all the time conversions displayed before you in the blink of an eye. If you’re someone that needs to make time conversions for activity planning, work, or even school, this template is available for you free. To learn more about the Time Converter template and download it for yourself, just read the guide below. Downloading the template is simple and effortless. Scroll to the bottom of this page and click the link we have provided for you. Once you have the document, you can continue to follow along with this guide. Now, open the file and start at the top portion of the document. You will find two cells at the start of the table where you need to enter your information. Start by listing what you want to convert. Sticking with the example already given, let’s say you want to convert 1 day into seconds. Once you have entered this data into the template, you will receive all the conversions (seconds, minutes, hours, days, weeks, and years in the table below. You only have to worry about one page to use the document. The template displays all conversions with each use. Only requires you to enter two items.